November is Diabetic Eye Disease Awareness Month. EYEcenter wants our patients to love and preserve their vision, whether they have diabetes or not–but during this time, please educate yourself on these conditions that could now or someday affect you or a loved one. Cataract is a clouding of the eye’s lens. Adults with diabetes are 2-5 times more likely than those without diabetes to develop cataracts. Cataracts also tends to develop at an earlier age in people with diabetes. The same scene as viewed by a person normal vision (Left) and with (Center) advanced diabetic retinopathy. 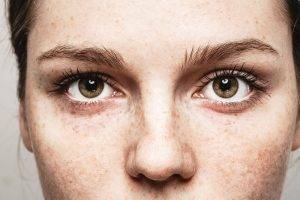 The floating spots are hemorrhages that require prompt treatment. 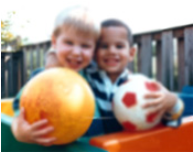 DME (Right) causes blurred vision. Photos courtesy of WebMD. Treatment for diabetic retinopathy is often delayed until it starts to progress to PDR, or when DME occurs. 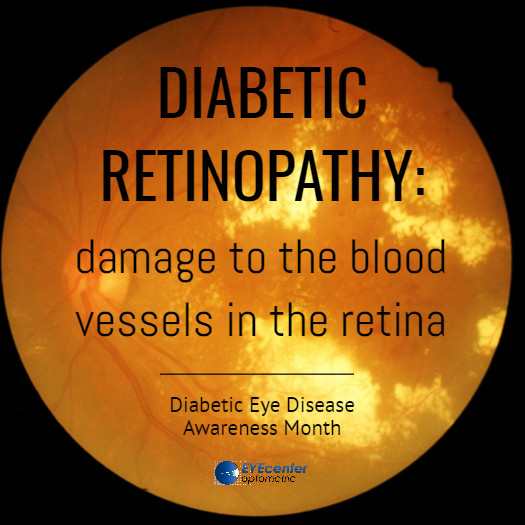 Comprehensive eye exams are needed more frequently as diabetic retinopathy becomes more severe. Preserve your vision–early detection is key! Call us to schedule your eye exam appointment today.